Find My Workspace lists over 95% of the business centres market in Stockton-on-Tees. Simply click Request Quote to check pricing for one office, or Add to Basket for multiple offices. This space provides high quality serviced offices ranging from 200 – 2000 sq/ft on flexible terms. With this centre you will gain 24 hour access, free on site parking, all inclusive packages for rent, CCTV and out of hours security patrol, utility bills and rates and a free gym membership. This brand-new business centre is located in Surtees Business Park, offering a well-connected destination for your business with state of the art features. The office space is available on flexible terms with scalable space from 1-100 desks making it the perfect environment for all types of business. The building offers exciting facilities including meeting rooms, an inhouse café, a cinema room and concierge services. The site is even pet friendly and boasts comfortable lounge space, a fitness centre and access to showers. 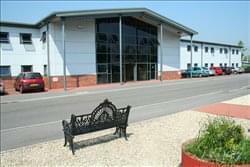 Tenants have access to the building 24-hours a day and ample secure car parking spaces. To obtain information for your selected Tees Valley Business Centres, please tick the "Add to basket" box for each office you prefer and complete the form below. We will then send a detailed report via email.